Mother Earth is a massive reservoir of negatively charged free electrons that we can tap in to and use as natural anti-inflammatory agents and antioxidants. In our modern lives we can’t always be outside and barefoot, but fortunately there are grounding mats, bedding and other products that use new technologies to provide this electrical “antioxidant” connection to the Earth in a convenient and practical way. The Universal Mat is made from durable 100 percent natural rubber containing a highly-conductive matrix of carbon particles. It measures 10 x 27 inches. Earthing patches great for applying the anti-inflammatory properties of Earthing to a particular part of you body. These patches are similar to the ECG/EKG electrode patches commonly used by doctors for testing purposes. When used for Earthing, you simply apply them to the skin on some part of the body, such as a site of tenderness or pain. One end of the accompanying Earthing cord snaps onto the patch. The other end connects to a grounded wall outlet or ground rod. Each order comes with 50 disposable patches and an Earthing cord. Earthing body band kits each come with three elastic, adjustable bands – one for ankle or wrist, another for knee, shoulder, or elbow, and the third for use around your midsection. You can use a band at night while sleeping or during the day while working or relaxing. 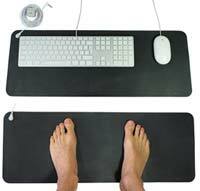 You can also use it instead of, or in addition to, an Earthing mat. The accompanying Earthing coil cord permits some mobility, for instance, should you wish to be grounded while doing yoga. This is a universal grounding / earthing sheet or ‘bed pad’ for optimal grounding while sleeping. It is a 100% cotton half-sheet with soft, yet durable conductive silver fibres woven throughout the material – in total each sheet contains nearly 1/3 mile of silver. The sheet measures 305cm x 91cm (120″ x 36″). This is big enough to fit across the bottom half of any size mattress, with ample tuck length. The sheet can also be used fitted length-ways from top to bottom covering the whole mattress. The actual conductive area is 201cm x 91cm (79″ x 36″) with a non-cotton tuck under of 52cm (20.5″) on each side. Colour is natural cotton (off-white).